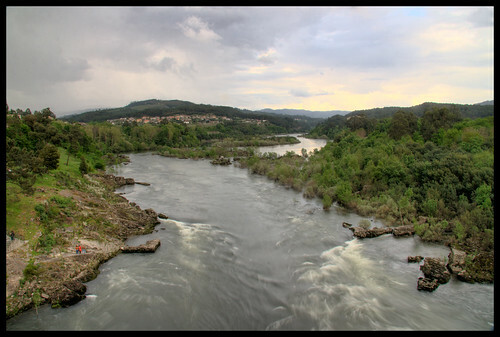 I headed down to the Southern edge of Galicia, where it borders Portugal (a noted absence of guards with AK-47s at the frontier was welcomed!) with some friends this morning to sample the legendary lamprey, an animal which I first came face to face with a couple of years back when I took this photo of the creature in a fish tank outside a restaurant in Santiago. It's not the most beautiful of fish in the world but I had been promised that, like monkfish and a few other beasts, it tasted a whole lot better than it looked. 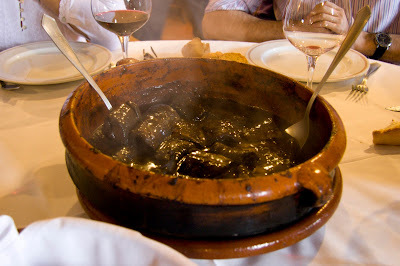 Santiago is not the place to sample the best lampreys, but the South of the province is legendary for their fresh fish and fantastic preparation (warning, the squeamish amongst us should perhaps skip this) - the animal is cooked in its own blood, making a rich, luxurious sauce. We made our way through the Al Barino and Ribeiro wine regions, stopping off in Ribadavia to see the Jewish quarter of this ancient town and wander the streets for a bit, before heading to a pulperia nearby for a little tapas to get the stomach juices going. Traditionally the best pulpo is found inland, where it is taken after freezing at the coast - the non-frozen pulpo is generally quite a bit tougher. We arrived at the restaurant a little after 3 and started with a cold dish of smoked, stuffed lamprey (lamprea rechea). I have to admit to being a little disappointed with this dish, as the fish is both tough and the flavor of the smoke overpowers the subtle strengths of the meat itself. The stuffing was also nothing to write home about. When the main plate came along however it was an entirely different story. 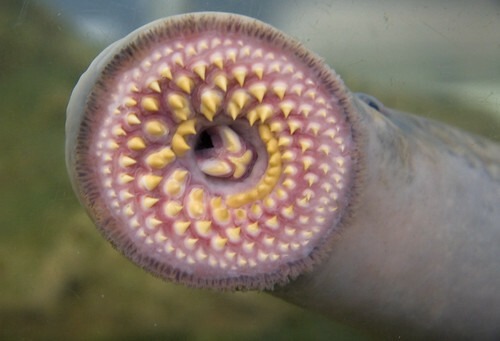 The simple dish of lampreys stewed in their own juices and served with crutons and rice is not an elegant looking piece of cuisine, but the flavour and texture of the lamprey are truly wonderful. I was taken aback by the amazingly smooth flavour of the meat, somewhere between a white meat and rich fish taste, it's really a powerful meal and I would recommend it to any foody in the area. 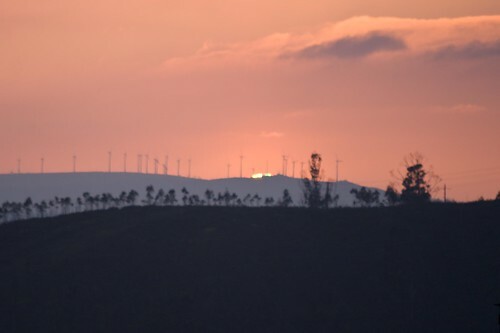 On getting home, just in time for the sunset, I set up the camera from the window of my flat and watched not only a green flash, but a blue flash, as the sun disappeared behind the hills. Sadly I only managed to catch the green flash on camera, but I'll keep a look out over the next few days for similar conditions. Anyway, no time today to go through any more Mozambique photos but hopefully a couple of evenings this week should see that finished off.